Paul found himself in jail—again. He was a repeat offender. In and out of the penal system all of his adult life. In fact, he would end up dying in prison. But, as we know, he was much more than a common criminal. The only laws he broke were those that stood against the advancement of God’s Kingdom. A radical departure from his former way of life! Today, we know Paul was innocent. The Philippians knew it, too. Heck, even Paul knew Paul was innocent! But rather than don the mantle of a victim and cry, “Woe is me!”— Paul thought about and prayed for the Philippian church (Philippians 1:3-4). Rather than be consumed with thoughts about himself and the injustice he suffered, he considered others and what was happening in their lives. How could he elevate his mind from dwelling solely on his circumstances to pray for others? And then, to top it all off, how did he experience joy from this practice? Paul did this because he understood what his trials were for. Plain and simple, he knew trials advance the Gospel. And at his core, that’s what Paul was all about. That’s what he spent his life “being poured out as a drink offering” for. Just like an upturned glass of fine merlot, Paul spilt everything he had to serve Jesus. His trials propelled the Gospel forward in a way that he couldn’t orchestrate via his own power, eloquence, or influence. His trials were used for the benefit of others, to build up, edify, and strengthen them. His trials served to make others bold in advancing the gospel alongside of him because of how he faced them. Paul didn’t wallow in self-pity or launch a PR campaign to garner sympathy. Rather, he rejoiced that God was at work through both his circumstances and his attitude in them. To our God, obstacles are opportunities. Because where human strength fails, God’s power shines. All eyes can fixate and focus on the singular, undeniable power at work because no one could possibly take the credit except for him. What’s your first reaction to trials in your life? 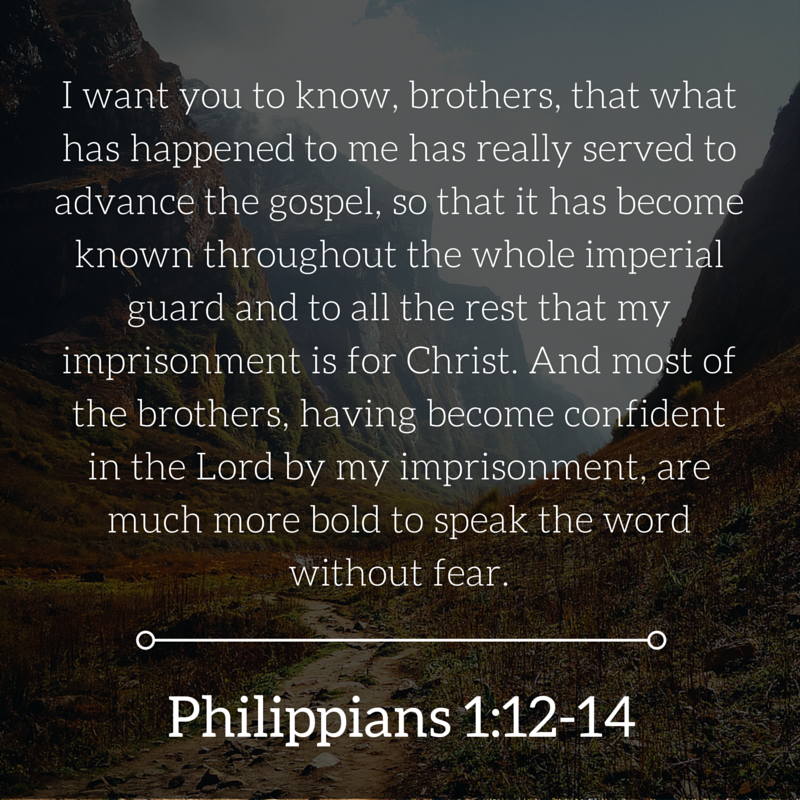 Do you believe your trials advance the Gospel? When you are wronged or face injustice, do you see it as an opportunity to advance the Gospel, edify your brothers and sisters in Christ, and embolden the Church? Where in your life can you prayerfully put this attitude into practice right now? Do you expect joy or displeasure in this practice? Why? Devotion by Jordan Loftis. Jordan is the editor of Short Daily Devotions and the author of The Men With Bare Feet: Discovering Intimacy With God Through Moses, Joshua, and Jesus.